Zach Ertz (center) catches a third-quarter pass against the Colts. It's more than coincidence, isn't it? You give this Eagles team a lead, you do not expect reciprocation. How times have we seen it? Week 1 against the Falcons. The Super Bowl against the Patriots. The divisional round against the Falcons. The opponent takes the field with under five minutes remaining and a chance to tie or take the lead. The opponent fails to score. On Sunday, it happened for the 14th time in the Eagles' last 22 games. This time, it was Derek Barnett in charge of the closing ceremonies. He didn't get all of Andrew Luck, but he got enough to send the veteran quarterback stumbling to the ground. One moment, the Colts were four yards away from taking a lead. Then, they were done, and the Eagles were 2-1, and none of it seemed as thrilling as the circumstance suggested. "You go back to 2016, we weren't winning these games," linebacker Nigel Bradham said. What are "these" games? Games in which you finish with a deficit in turnover margin. Games in which the zebras dock you 110 yards' worth of penalties. Games in which the opposing coach knows your playbook and your checks and your tendencies better than any other human being who does not currently have a workspace at One NovaCare Way. Games in which the air is gray and the turf is damp. Games in which your top two running backs and your top two wide receivers are in street clothes. Games in which all of these factors conspire so that the talent imbalance that exists between the rosters is not adequately reflected on the scoreboard. Sunday was one of those kind of games. The Eagles might not have been the better team with Nick Foles at quarterback, but they certainly were with Carson Wentz. Against the Colts, he made throws that Foles did not make in last week's loss to the Buccaneers. He eluded pressure that Foles could not escape at Tampa Bay. There was rust, no doubt. But the Eagles outgained the Colts, 379-209, in total yardage. They racked up 26 first downs to Indianapolis' 14. They doubled the Colts in time of possession (40:20 to 19:40). "If we score touchdowns in the red zone, we're not worrying about a fourth down stop at the end of the game," tight end Zach Ertz said. The thing about this team, though, is that you seldom need to worry. It's a credit to coaching, and it's a credit to culture. The Eagles' defense was coming off one of its worst performances in Jim Schwartz's tenure as its coordinator. Not only did the Eagles fall to 1-1 with a 27-21 loss to the Bucs, they allowed 402 yards to a Harvard grad. A lot of weaknesses were on display, particularly in the secondary, where third-year cornerback Jalen Mills spent much of the afternoon scrambling to get into the same camera frame as his man. Sunday, then, was a return to normalcy, highlighted by a red-zone defense that saved the day on a number of occasions. 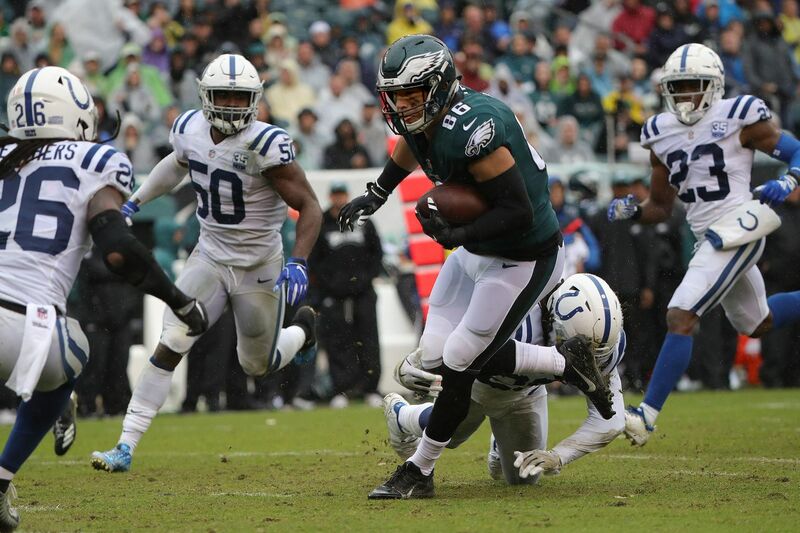 The Colts were inside the Eagles' 20-yard line on four of their last six drives of the game, but they managed just three field goals, plus that final turnover on downs on fourth-and-3 from the four-yard line with just over a minute remaining. "I think a lot of the times, at the end of games, especially close games, it comes down to execution, and, really, your defense," safety Malcolm Jenkins said. "Can you get a stop? Whether it's a shootout, or it's just one of those defensive games, it always comes down to whose defense makes the last play. … We ended up making one more play than they did. Oftentimes, that's the difference in this league. We feel very confident in somebody making that play for us." That confidence is something that this team exudes on both sides of the ball, and you can't help but think that it is one of the chief factors behind their persistent refusal to succumb to circumstance. Of the eight backs and receivers who had an offensive touch in Sunday's win, only three were in uniform for last season's Super Bowl. Wendell Smallwood, who was inactive for the game, carried 10 times for 56 yards and the go-ahead touchdown with 3:02 remaining. Undrafted rookie Josh Adams had six carries. Three Eagles tight ends combined for 13 catches and 156 yards. "I really feel like good football teams find ways to win, and we've been able to do that," coach Doug Pederson said. "In tight, close ballgames, we've been able to figure it out and win, and that's a tribute to the guys in the locker room." It's also a tribute to Pederson. A lot of teams would have found a way to lose Sunday. The Eagles' ability to do the opposite has been a hallmark of their head coach's tenure. The quarterback has something to do with it. But there is also something unique about the rest of the collective. Wins like this one are the result.